For instance, I know one should not turn on red lights, which is different from US/Mass. rules. 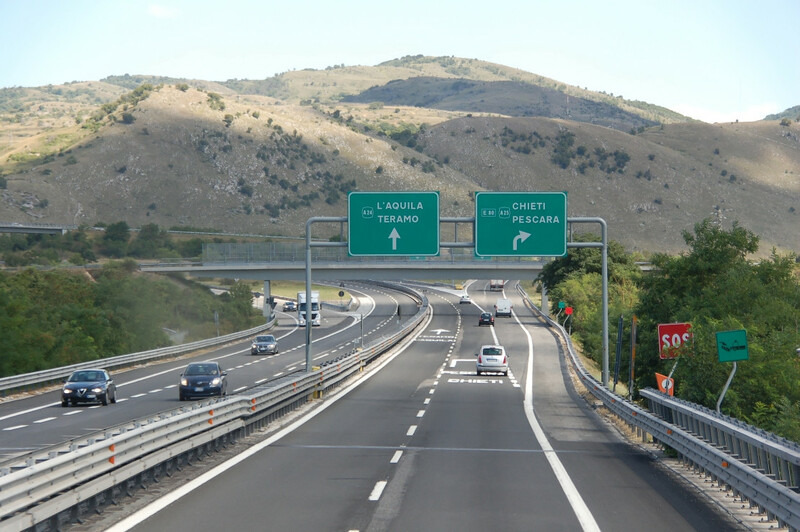 What are other things which can confuse a driver from US while driving in Italy? More generally, are there things a North American driver should know about driving in Europe? Here are some advice. This is focused on those aspect of road safety (e.g. "how bad they drive") to warn the reader and have him prepared for a safer defensive drive. For this reason, please remember that while from my explanation Italian motorists will intentionally look insane to you, they have a very strong defensive drive concept and actually drive quite safe according to recent crash and fatality statistics. Also my answer is targeted at any U.S. citizen wishing to visit Italy, so I am posting trivial advices as well. I have found all footage via Google Images and cited respective copyright owners. Roads are narrower than NA, drivers are quite aggressive. Expect people to accelerate on red/yellow light and cross timely like Swiss watches. 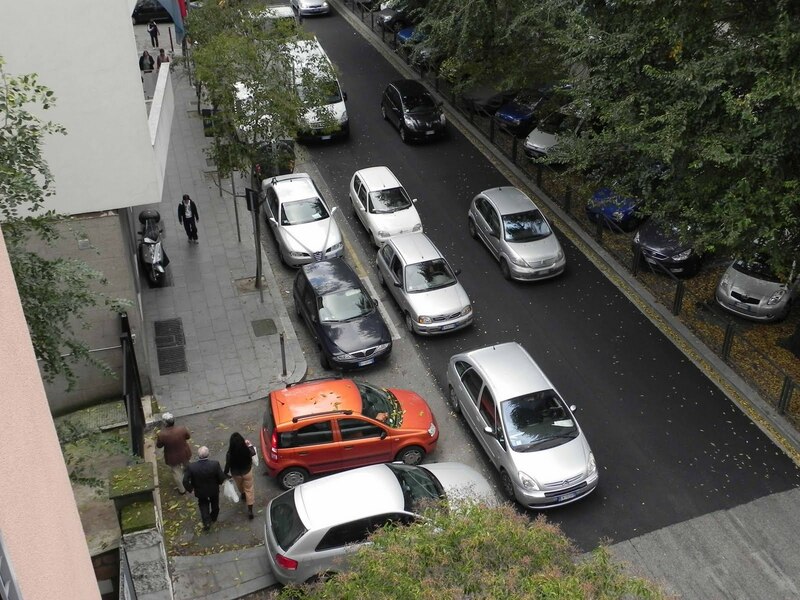 Expect narrow roads, but with even less space because of cars [illegally] parked "2nd lane". Remember that red light is mandatory stop without exceptions or turnings. Left turn is allowed on multi-directional lights when left-pointing light is green. Use your indicators despite other motorists may not do so. Keep your distance from car in front of you despite some won't. Motorbikers will pass you from every direction, right included. They know their vehicle and the road, so just don't assume that no one is on your right. Take a look at your mirror, every car is mandated to have both. Do not be an obstacle. Better to use indicators more than less. But other drivers are very well prepared to act if you forget to announce your turn. General rule: incoming from the right has right to pass. City trams always have precedence, buses don't have special treatments. In a roundabout, you must give way to your left. People will try to provoke you on a STOP. Italians are used to not to politely stop for allowing other vehicles to enter the main road, so they found their own technique. A car stops at intersection for allowing crossing vehicles to pass and avoid a crash, but slowly puts the nose into the intersection so that eventually will obstruct the path. Drivers will mostly thank/salute each other with gesture. Another thing to remember is that Italians tend to occupy all and more of the lanes during congestions. Expect three rows of vehicles on road with only one-and-half lane. They are difficult to spot. 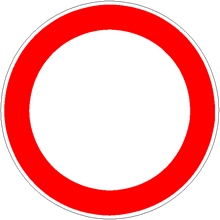 The above is the standard sign for forbidden traffic. It is mostly accompanied by an explanation tab below citing exceptions, e.g. "eccetto bus e taxi" (except buses and taxes). Because of the rules complexity, foreigners are recommended to stick to the above presciption and stay away from those roads/lanes. Often you will find a mandatory prescription to stay on the right (Arrow pointing southeast on blue background, anyone can edit this post with a picture), follow that. ZTL is acronym for Zona a traffico limitato and there is plenty of literature on it. They are patrolled by enforcement cameras and you will see a lot of vehicles using them. That is the most common trap for motorists from different Italian cities. I know of lawyers negotiating with court for packages of dozens of traffic violations to the same individual (yes, court often discounts multiple repeated sanctions bona fide into a smaller penalty). ZTLs are not 24/7 and often they are accompanied by an electronic display indicating where entry is permitted or not. Use them wisely. The image and quotation for this paragraph are taken from literature to explain the cultural differences between IT and NA motorists. Please follow me for a few minutes in this. In the Betrothed novel a very famous quote between noblemen says "Fate luogo voi, la diritta è mia" ("You move out, the right is mine"). 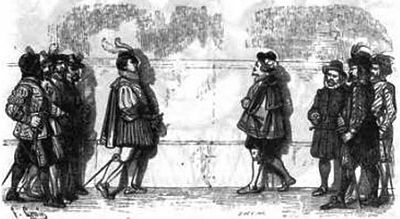 Noblemen from early centuries had to stop and allow noblemen from higher rank to pass. On foot. The above is unfortunately applied to road traffic. Motorists sighting (from distance) a vehicle who want to enter an intersection and who is giving the right will likely accelerate and/or flash, even if they have sufficient distance to slow down and allow the inbound vehicle to safely cross the intersection. Law says that vehicles must allow precedence to vehicles from the right already entering the intersection or who don't have sufficient space to brake. STOPs and PRECEDENCEs (reverse triangles) means you allow left and right traffic before yourself. But that does not imply that drivers should politely allow traffic from alternating directions. Drivers think that of the right of pass as a constitutionally-granted human right. According to the above quote. Also drivers fear that a vehicle slow to restart may slow the entire traffic down. This is why the "nose trick" always works. I am waiting for my first crash to tell the other driver "the right is not the Manzonian novel right". So drivers will just make your life difficult in entering an intersection, whether cross-intersection or roundabout. For reasons unknown to me, there is a strange behavior that is self-compensated. 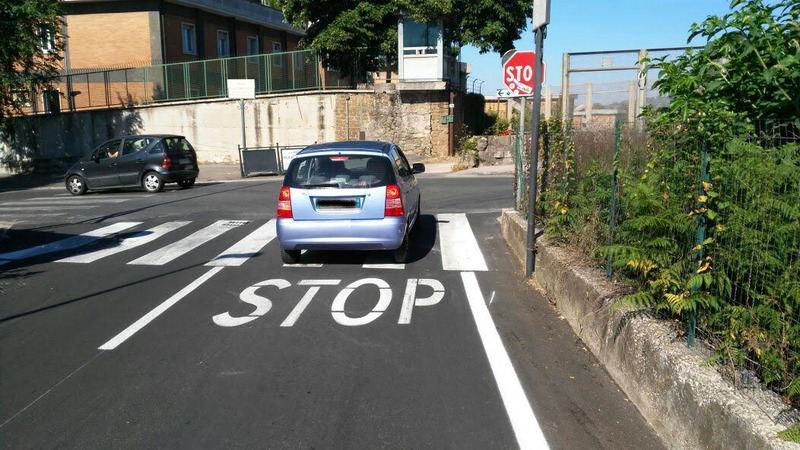 Neapolitan drivers will not left-give-way on roundabouts. They will lauch their cars into the roundabout stopping vehicles on their left (who should pass), but immediately will stop for vehicles incoming from the right. In the rest of Italy, bike wait for red before entering. In Naples, red will brake allowing bike to enter, bike will accelerate, enter rundabout, then will brake for other traffic from his right, giving entirely up his right to pass. Headlights on every time. This may cost you a sanction. Remember that speeds are in km/h. If you are driving at 75, you may need to ACCELERATE. Excessively-slow speed is an offense but is mostly never sanctioned (out of curiosity, the fine equals to speeding +10km/h). Right lane is not for the socially-unlucky, and you will not be infected by leprosy or hepatitis driving there. That is one thing Italian motorists never understand. Right lane is for everyone when it is free, and you are supposed to drive on the rightmost free lane all the time except when passing or when traffic is congestioned. Expect few drivers to follow this rule. Some may argument that speed limits are enough slow that vehicles drive all at same (fastest) speed. You will find a lot of drivers sticking without a reason on the leftmost lane just because they are driving at the speed limit or worse 10 below. And because of this sometimes drivers do the illegal "Gattuso maneuver" (a football-related metaphor for right pass). Blue: credit cards only. No fees!!!! Exceptions are some experimental northern highways implementing free-flow tolling for everyone, not just subscribers. I don't want to tell the full story here. Grab your link and see yoruself. Also mind that the rightmost lane, outside of continuous white stripe, is a breakdown lane. It is a severe offense to abuse it, especially when you feel the temptation of skipping traffic. On the contrary, when traffic is stuck you are legally allowed to use the last 500 metres of the breakdown lane to reach the next exit. You know the official speed limits, I won't repeat myself. Do not expect to find them often at maximum, most roads mandate slower speeds. Beware of signals! Hit and run (omissione di soccorso) is another serious criminal offense that may cost jail sentence. In case of collision with harm to people, you must, either, stop and rescue or (yes you can) call emergency at 112 -providing all relevant information on the crash and your identity- and then escape. For example, you may need to go to hospital on your own or feel unsafe at the crash site because you fear being personally assaulted for revenge. An exception applies to medical/paramedical personnel, which is obligated to provide active rescue/treatment more than simply calling for external help. This applies to passengers witnessing a crash from another vehicle. If they are doctors, they are required to stop unless an ambulance is already at the crash site. Failure to provide such help to the injured is also very criminalized in Italian culture, e.g. you won't have many Italian friends easily if they know. Personally, in the unlikely case of crash, I would recommend to provide as much medical help as possible not only because of the obligations above, but because courts take this into serious account to discount the sentence. Remember that while insurances pay for any damage to objects, animals and people, causing any kind of injury to animals and people is considered criminal offense and will be prosecuted. Police is also generally more severe to foreigners than locals. They tend to pull over a lot of foreign cars for routine checks. One of the several reasons is that most insurance/tax checks are done automatically by ANPR cameras on board and on the road. Driving a rental car puts you on the "local" status from this point of view. Another thing to look carefully about police, and is quite unknown to the locals as well, is that while the officers are very kind and helpful to people needing help (they won't give you indications but are well trained for rescue and will call any help needed in an emergency), they are severe as well with anyone. 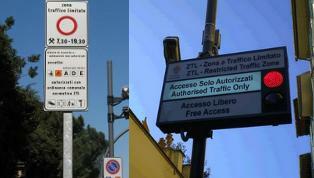 Italian traffic code is so complicated that it is nearly impossible not to commit any violation, including trivial. There is a huge list of trivial violations that most drivers commit every day but gets unnoticed. If you are not cooperative enough with the officers (of course they cannot exceed their powers, e.g. inspecting your phone or demanding your mail password in a duty check) they have the power to work their best to let you go with a couple of traffic tickets on your head. And they are good at that. That is: you have your rights, they have their duties. Inner city vs between cities are two different things. The easiest driving is between cities; once you are out of the city center, streets and roads are usually better organized, larger, and straighter. Highway driving is more or less the same; on multi-lane highways, stay on the right side of the road unless passing. Inner city driving, depending on the city is hectic and fast paced. There are a lot of one way streets and a lot of pedestrian areas that makes things interesting. Watch out for split streets with lanes for taxis and buses and trams. Plan your itinerary carefuly, if using a GPS download the latest maps; Know in advance where you will park your car; most city center have expensive permit systems; more cities will have private parking spaces that might nit be close to where you want to go. Cars need to have safety items in them. "Compulsory equipment on board : triangle; spare tyre; extinguisher (recommended) and reflective safety jacket, which must be used outside towns and villages in the event of a stop during the night or in poor visibility conditions, or when stopping on emergency lanes or lay-bys. " If you rent a car, check the items are there (they should be there). 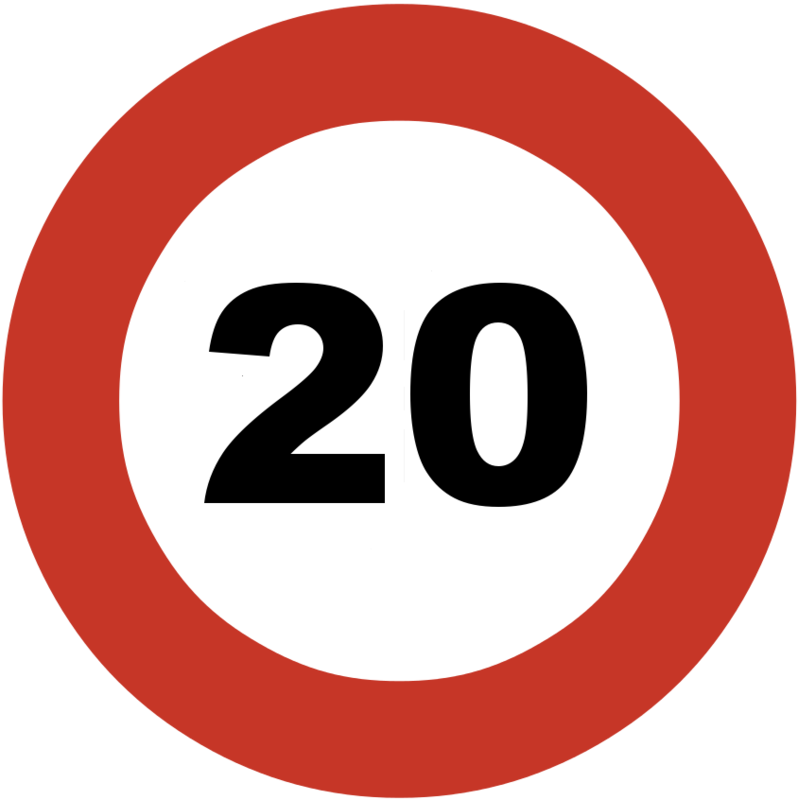 This does not mean that you slow down to 20 km/h which really invites a massive pile-up, but is intended as "construction" indicator...such signs are ignored, even by police. It can be also 30 or 10, it is simply a ridiculous low speed. In contrast to other countries the construction end is not indicated. Traffic light driving by actually looking at the traffic light. This is one thing where I find the Italian solution really superior. In Germany, the drivers are only looking at the car in front and wait until that moves, so from above it looks like a rubber band when the traffic light turns green. 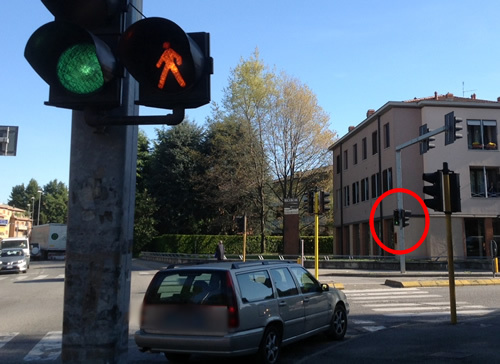 In Italy, you look at the traffic light and once it switches green, everyone accelerates simultanously. I have heard many excuses like "This cannot work", but you only need some concentration, then it is quite easy. You get far more cars over the crossing and the traffic moves much more fluently this way. I sorely miss this system here. Generally, do not trust traffic regulations and concentrate much more on your environment and your fellow motorists. Italians are much more used to communicate, while from the outside it often seems chaotic, they see you (!) and if problems arise (right of way etc.) it is often solved by signals. When driving across country in the south of Italy towards "City A" from "City B". I would see a sign that had "City A" marked on it, but the sign would be constructed such that it looked like an arrow pointing at 90 degrees to the direction of traffic - which implied to my non-italian mind that I should be turning in that direction, but of course actually meant keep on going in the direction you are headed. Whenever I saw this I would get a huge cognitive dissonance between what I saw and what I knew the route to be. At first, I was surprised by the exit signs on the motorway. Shortly before an exit, you will see two signs, an arrow pointing upward/forward more-or-less above the left lane and an arrow curved to the right more-or-less above the right lane. Following that, there are also markings with a right-pointing arrow and the name of the exit, directly on the road surface. To me, this looked like the right-lane would go to the city named on the exit signs and I had to switch to the left lane to keep going in the same direction. Not so: Most of the time (as on the picture), the exit just branches off the right lane like a regular motorway exit everywhere. After discovering this and making the mistake a couple of times, I also made the opposite mistake (not realise you had to preorder on a specific lane depending on your destination). I also found the access roads very short, by European standards. 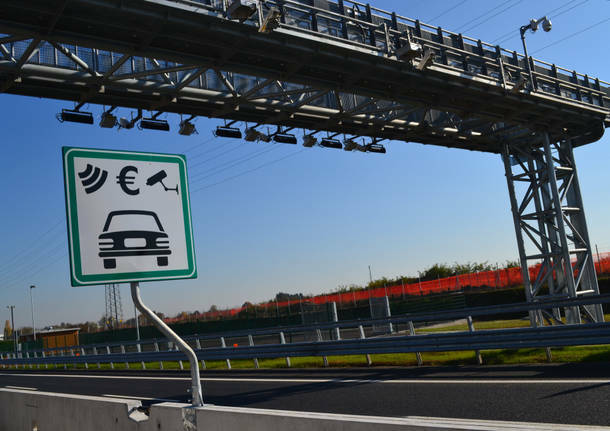 And drivers on Italian motorways can be fast(er than in the US), which means you need to be especially alert to incoming traffic when you are already on it and be able to accelerate quickly when you are getting on it. Road rules are basically the same. Traffic lights: if the traffic light is red, you can't go right. You just stop and wait. You don't go anywhere. Most city centers, especially in old towns, are closed to traffic. You will see street signs telling you that you can't go in. So usually you park outside and then you walk. lot of people will honk at you if you show hesitation, but don't worry, it's their problem if they are in a hurry. I see that there are a lot of generalized comments, like "always give the way" (!!! ), but the reality is that the more you go south, the less the road rules are followed. The roundabouts are a good example of this: in the north you always stop to give the way to whom is already in. It looks like in the south there is a different behavior sometimes, so just look of what happens at the car in front of you. Not the answer you're looking for? Browse other questions tagged legal driving italy tips-and-tricks local-customs or ask your own question. Roadtripping from NYC to Boulder, CO - sites to see along the way?